By Jeff Aranow: Freddie Roach says he views middleweight champion Gennady ‘GGG’ Golovkin as his friend, but he still thinks he’s going to lose to Saul Canelo Alvarez in their rematch on September 15. Roach says Canelo is the younger fighter with the faster hands, and he’s fresher than the 36-year-old Golovkin. Roach notes that Golovkin (38-0-1, 34 KOs) had trouble cutting off the ring to get to Canelo in their fight last year on September 16, and he feels that the Kazakhstan fighter’s legs have slowed down due to aging. The two areas that Roach didn’t discuss is Canelo’s weight loss, and his possible loss of punching power. In the previous fight with GGG, Canelo was clearly bigger than him with a physique that looked like an amateur bodybuilder. Canelo’s muscles are now gone and he’s not as big as he was last year when he fought GGg. If the power and size isn’t there for Canelo, he could have a lot of trouble matching up with Golovkin, because he’s the same size as he was last year. Nothing has changed with Golovkin except that he plans on being more aggressive. Golovkin will be defending his IBO, WBA and WBC middleweight titles against Golden Boy Promotions star Canelo Alvarez on September 15 on HBO pay-per-view at the T-Mobile Arena in Las Vegas, Nevada. “It’s a big fight. It’s a great fight to watch,” Roach said to BehindTheGloves about the September 15 rematch between Canelo and Golovkin. “The first fight was very close obviously, and I can’t wait to watch the second one,” Roach said of the Canelo-GGG fight last year. ”It should be fun. GGG is my friend. I like him. I know him very well, but I have to take Canelo. I think Canelo is younger, fresher and faster right now,” Roach said. If Golovkin lets the fight go to a decision once again, then he deserves to lose. GGG should have learned his lesson from the first fight not to let the judges have a say so in the outcome of the fight. The view from press row for the previous fight is Golovkin beat Canelo by four rounds by a 116-112 score. You can argue the fight was somewhat close, but there was a clear winner in Golovkin. Canelo stopped putting out effort after round two, and he allowed Golovkin to dominate rounds 3 through 12 by outworking him. Canelo outworked Golovkin in rounds one and two, but that was before Golovkin started to really press the action. Once Golovkin started to pressure Canelo in round three, the fight looked like only one fighter was putting out constant effort and that was GGG. Canelo appeared exhausted from carrying around all the extra muscle that he’d packed on for the fight. Golovkin had no problems catching up to Canelo. The critical mistakes Golovkin made in the fight was standing on the outside trying to box Canelo. Golovkins decision to stay on the outside allowed Canelo to move out of range to take rest breaks, and to avoid getting jabbed. Golovkin’s trainer Abel Sanchez was slow at giving him instructions to take the fight to Canelo. The other mistake Golovkin made was not using his pressure and punching power to force Canelo to fight him. Golovkin let Canelo survive the entire fight at his own venue at the T-Mobile Arena. That a blunder on Golovkin’s part, because he left it in the hands of the judges, and they gave the home fighter Canelo a draw. One judge had Canelo winning 10 rounds to 2. Short of knocking Canelo out, Golovkin was never going to beat him with that kind of a judge scoring the fight the way she did. Golovkin needs to figure that he’s going to have the same kind of judging in the rematch, which means he should be thinking knockout all the way instead of trying to box his way to a decision once again. Roach went onto say that he thinks it’s not a good thing that Golovkin is trained up in altitude in Big Bear, California. Roach says that he’s talked to a doctor who tells him that athletes that train at altitude must train three times as hard, and it wears them out. Roach feels that for it to help a fighter like Golovkin, he would need to train both at altitude and at regular sea level each day. That’s obviously impossible due to the long drive that it would take to get from the mountains to sea level each day. It’s unclear whether Golovkin gains anything by fighting at altitude in terms of his stamina. All we know is that Golovkin’s stamina looked fine in his fight with Canelo. Golovkin wasn’t the one tiring out in the fight. It was Canelo that looked exhausted after round three. Until Golovkin starts showing signs of having stamina problems, you would to conclude that his high altitude training at Big Bear isn’t hurting him. Canelo’s training needs to be put under the microscope by Roach, because he clearly had serious conditioning issues last September in the first fight with Golovkin. Since training at sea level didn’t help Canelo, perhaps he should train at high altitude because he looked completely exhausted against GGG. If Canelo has lost punching power for whatever reason, he’s going to have problems beating GGG on September 15. That might be the downfall of Canelo. 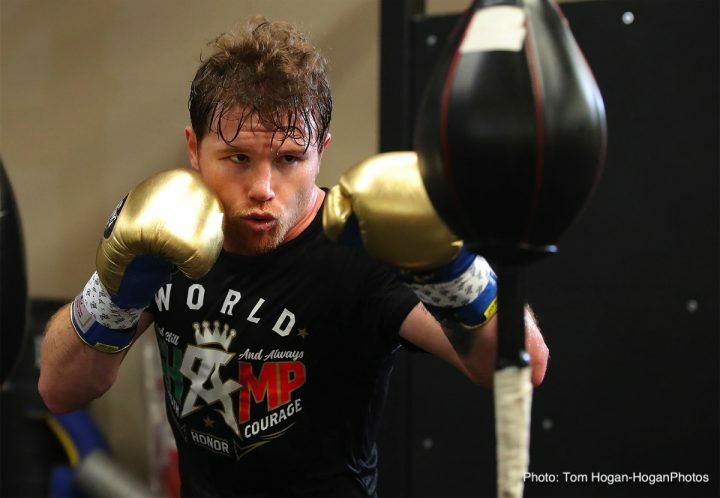 In the training photos and video, Canelo looks like a junior middleweight in the Miguel Cotto mold, and that’s not good news for him facing a much taller and naturally bigger Golovkin. Canelo is only 5’8″, and he’s looking really small now that he’s lost a lot of muscle. It could be a real size mismatch. There’s reasons why there are weight classes. Canelo should be still fighting at 154. He’s too small for middleweight now that he’s lost his muscles.